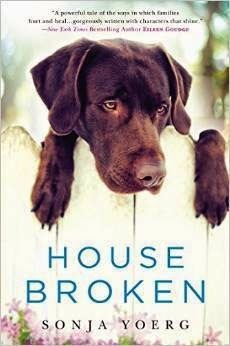 House Broken was touted as a breakthrough novel from a new author and although I can see her strengths as a writer, a lot of the story just felt too contrived and unrealistic for me to rate it higher. Despite not feeling the story was plausible, I did really enjoy it and found the book to be quite readable even with that little niggling feeling in the back of my head about whether or not these things could actually be happening. I did like the continuity of the names of Geneva and her siblings, because let's face it, a lot of people have some sort of plan when they name their children so why not have city names. For someone so intelligent though, I didn't quite buy that Geneva was so unaware of her children's issues yet I could believe that she blocked out her mother and sister's. I also didn't believe that she was so at odds with her husband and then everything would be ok. For something that was supposed to be an underlying tension built up over time, I just thought it would play a larger and more consistent role in the story. There were quite a few allusions to things that were never developed more, like issues with her in-laws, the Novaks, that I felt could either be left out or needed to be expanded upon. But again, House Brokenwas one that I read quite easily so I think that Sonja Yoerg has a fantastic career as a writer coming up.